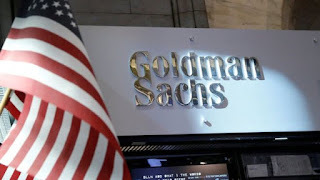 US banking giant Goldman Sachs has reported a fall in third-quarter profits following a further fall in bond trading revenue. However, the 26% drop in bond trading revenue was smaller than expected, following a slump of 40% in the second quarter. Goldman's net income for the quarter fell by 3% from a year earlier to $2.04bn (£1.55bn). Rival Morgan Stanley posted a stronger-than-expected rise in profits. Net income rose 11% to $1.69bn in the third quarter, helped by record revenues in its wealth management division which offset the decline in trading activity. "Our third quarter results reflected the stability our wealth management, investment banking and investment management businesses bring when our sales and trading business faces a subdued environment," said Morgan Stanley chief executive James Gorman.